A good webinar ought to feature a warm welcome for the audience, including early people who arrive early. However, that material may not be appropriate to include in the replay people see later — you want them to be able to get right into the content of your broadcast. 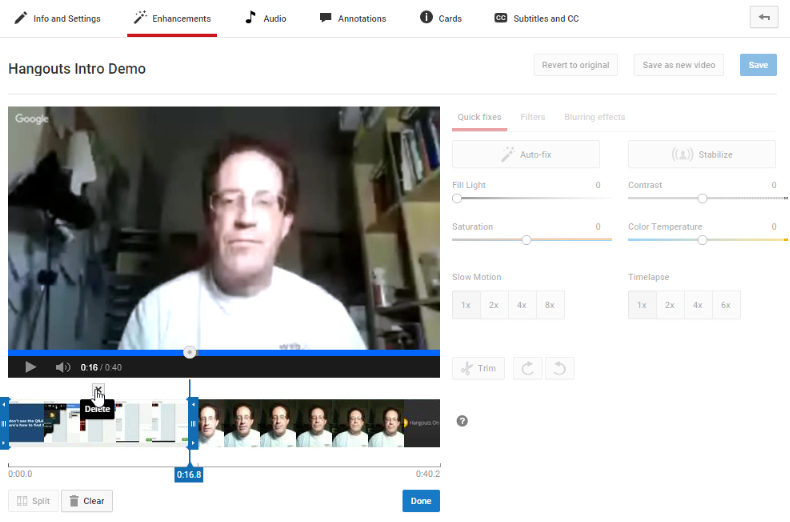 Trimming a section from a YouTube video, such as a Hangouts replay. I’m learning a few things as the result of a current series of webinars about RSVPMaker’s support for Google Hangouts on Air, as well as my WordPress for Toastmasters project. One of the virtues of the Hangouts on Air platform is it automatically captures everything you broadcast to YouTube, which is a great way of building your library of YouTube content and reaching many more people than were able to tune in live. Fortunately, YouTube also provides a way for you to edit out anything you do not want included in the replay. For a session where Q&A will be encouraged, I am finding that it makes sense to open up the live session a few minutes early and display some information about how to use the Hangouts Q&A app. One possibility would be to show a PowerPoint slide. However, to keep things simple in a context where I’ll be giving a web app demo, I cooked up something where I can show a web page with a countdown timer and some imagery. I toggle full screen viewing of that countdown/welcome page in a separate browser window. When starting my broadcast, I screen share that specific browser window. Here is an example of what that looks like for an event starting at 7 pm EST (opens in a new browser tab). I created a utility, which you can access at rsvpmaker.com/countdown, that lets you specify the star time and the welcome image you want to use. Or download the source code, in case you’d like to tweak it. While showing this, I keep my microphone muted so people don’t hear me shuffling papers or whatever. You could just as easily use this time to make small talk with the early arrivals. In any case, at the appointed time, you should switch from preliminaries to the live show starting. One tip is to allow a moment of silence before you start speaking to make it easier to edit out everything prior to that first spoken word that signals the start of the show. Here is how you can clean up the recording after the show. The example I show is trimming off the beginning of the video, but it’s also possible to cut out a section in the middle. That’s the great thing about video: you can edit out your mistakes. Note that your edits do not appear instantly. The delay appears to be proportional to the length of the entire video. If you really want people to see the cleaned up version of the replay, you may want to avoid sending out emails and social media messages driving people to the replay until you can confirm that YouTube is done processing your changes.